Following the UK publication of his remarkable verse novel, A Long Way Down, last year, it is good to welcome an earlier novel by this multiple award winning author. This one was first published in the States in 2016 and is the first of his Run (US title Track) series of four books that has featured in the New York Times best seller lists. Each book is written from the point of view of a member of The Defenders youth running team, kids who have been brought together from different city backgrounds to take their place on the team, exploring what the experience means for each of them. This is the story of Castle Cranshaw, aka Ghost, a boy whose father has been imprisoned for domestic violence, including shooting at Castle and his mother. Ghost is haunted by the memory of his father and his own life is punctuated by “altercations” that lead to frequent school suspensions. 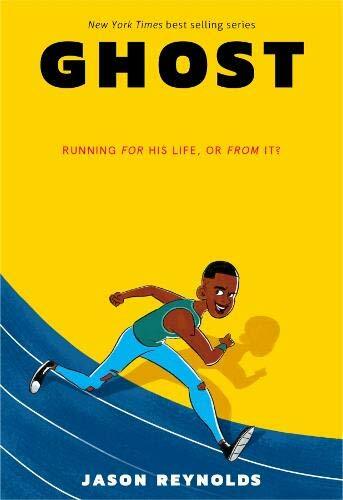 It’s an old American story of how sports can transform troubled youth, but it’s an excellent version for pre-teens, with a convincing first person narrative that reveals Ghost in all his contradictions and charts his changing perceptions of himself, his community and his running mates. It’s told with economy, humour and understanding of the pressures of growing up, especially growing up poor in America.